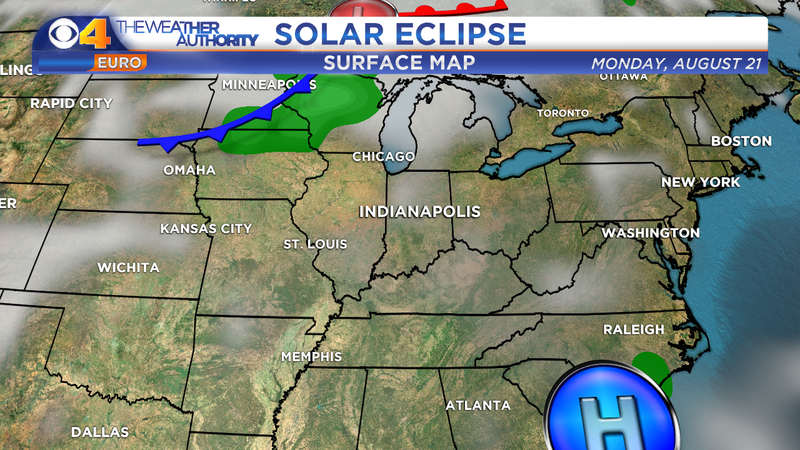 We are now less than five days away from the much anticipated Solar Eclipse. In the Weather Department our eyes are focused on what the weather will be like for the day. As we get closer computer models usually come in to better agreement as to what cloud cover and precipitation will be. So far, the two medium-range computer models we use are at odds. GFS's cloud cover and precipitation rate projection at 2pm ET Monday. ECMWF's cloud cover and precipitation rate projection at 2pm ET Monday. The two computer models we are looking at is NOAA's global forecast model (GFS) and the European Forecast Agency's global forecast model (ECMWF). The best viewing of the solar eclipse will be with less cloud cover. 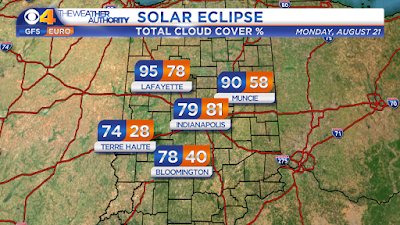 For that we want to the total cloud cover percentage as close to 0% as possible. 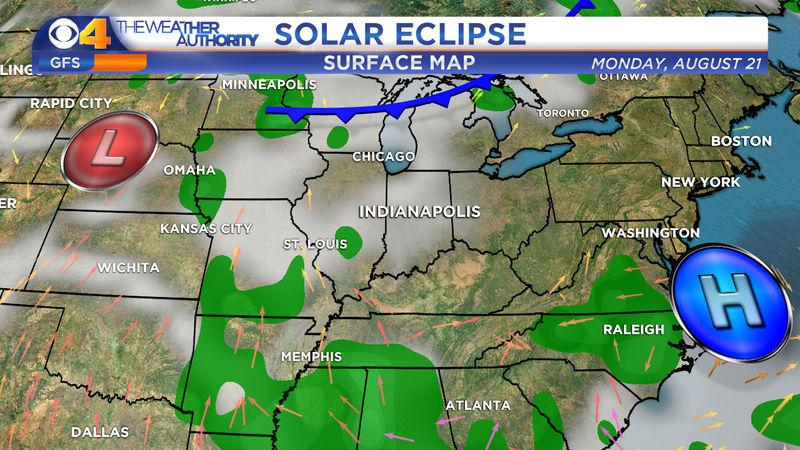 While you may be able to see some of the eclipse through the clouds, the more clouds overhead, the less you will see. As you can see in the images above both computer models project clouds around in the Midwest on the afternoon of the 21st. 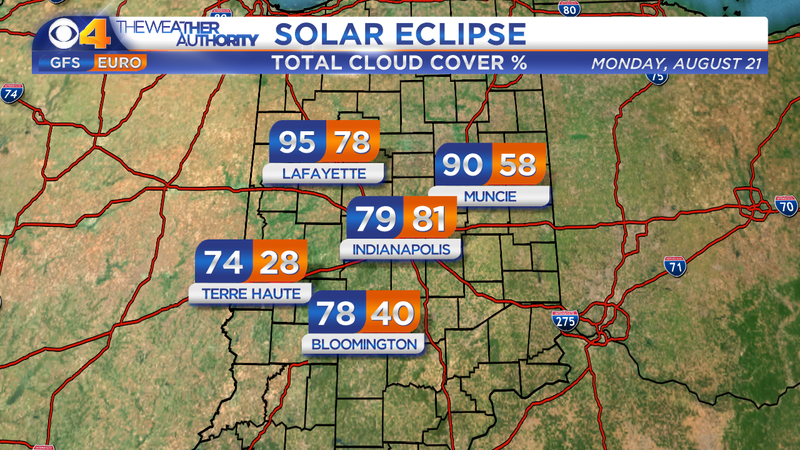 Here's a more specific look at the projected total cloud cover percentage at 2pm Monday, August 21 around central Indiana. Understand that there are another 35 computer model runs to go before the eclipse gets here. And that's just for these two computer models. Once we get within 72-hours of the event, additional computer models will chime in with what they think will happen with the weather conditions.